The 6' x 6' (1.8 m x 1.8 m) Above Ground Pressure Booster Station is an economical, compact, pre-engineered unit shipped complete from the factory. Just add power and connect piping. Outside, the neat, trim, low silhouette enclosure blends with the surroundings. Fiberglass enclosure resists corrosion and provides protection from weather. Hinged and removable panels provide easy access to pumps and controls for maintenance and service. Vandal-resistant design for added security. 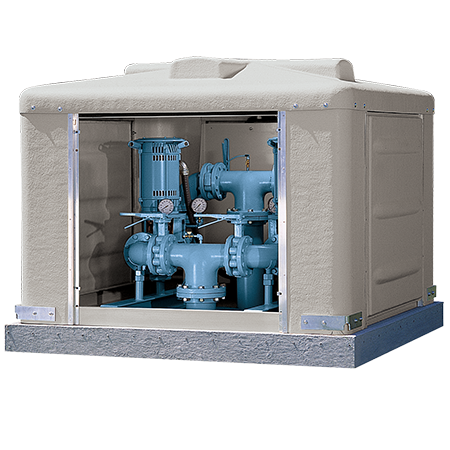 The fiberglass enclosure accommodates two pumps and motors sized to meet your requirements.